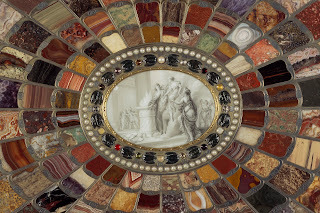 “Gold, Jasper, and Carnelian: Johann Christian Neuber at the Saxon Court” is an exhibition currently showing at The Frick Collection in New York. It is an absolute gem of an exhibition, pun intended. It is a collaboration of the Frick, Galerie J.Kugel in Paris and the Grünes Gewölbe (the Green Vaults) of the Staatliche Kunstsammlungen Dresden. About 250 years ago, Neuber was director of the latter institution. Johann Christian Neuber (1736-1808) was a renowned goldsmith who was appointed to the court of Friedrich Augustus III, elector of Saxony, around 1775 and served in that capacity for the rest of his life. 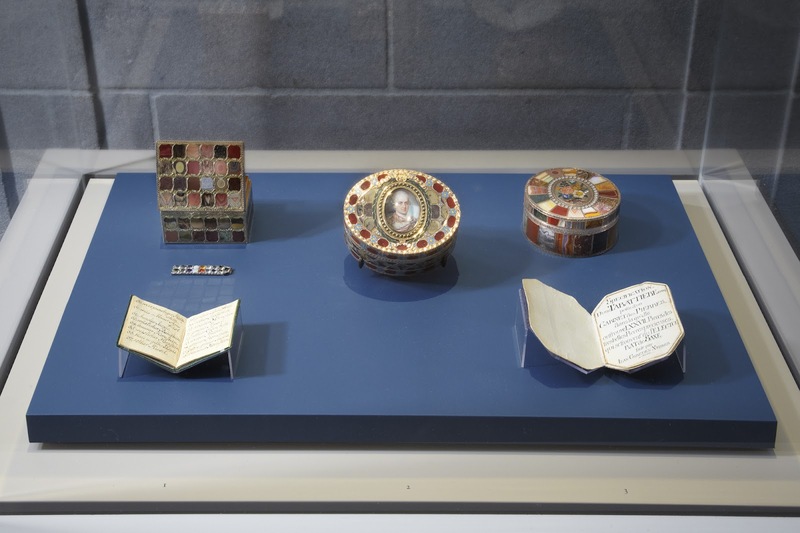 His specialty was working with gemstones from the Saxon region, his most popular boxes showing floral, landscape and complex geometric designs. 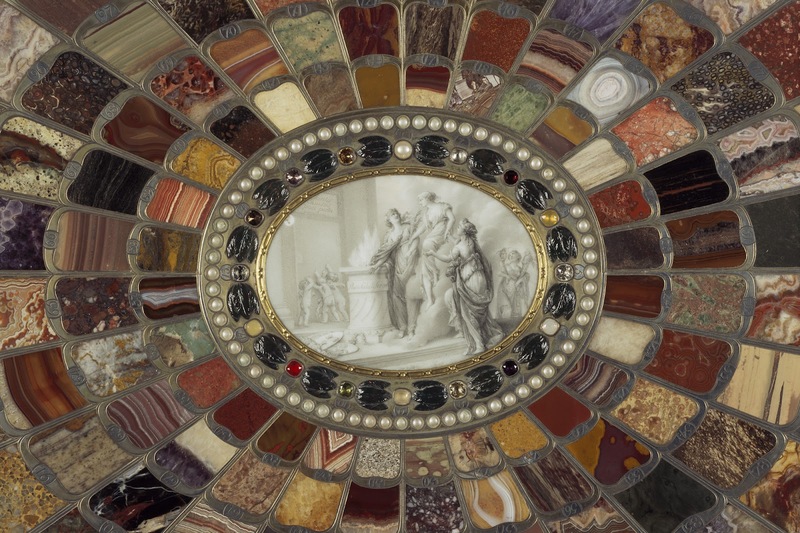 At the time there was a growing interest in the natural sciences and Neuber’s stone work was very much in vogue. Feeding on this interest he used local stones, not importing them, and went out of his way to identify the stones and where they came from. The exhibition is neither exhaustive nor exhausting but a perfect size to convey the artist’s work and technique. 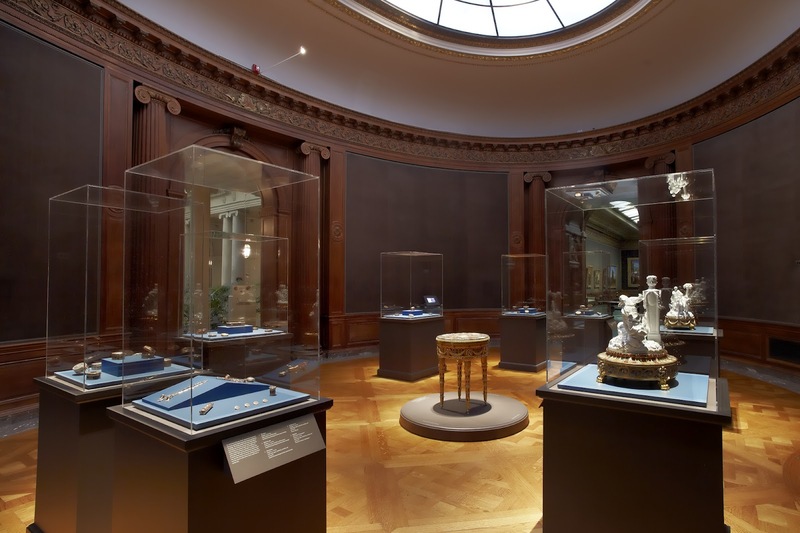 It is beautifully curated by Charlotte Vignon, Associate Curator of Decorative Arts, and Ian Wardropper, Director, of the Frick Collection. Works are arranged in the center round gallery of the museum. There are 8 cases showing roughly 35 boxes, a few pieces of jewelry and 2 large Meissen porcelain allegorical groups on bases by Neuber. The boxes are either tabatières (snuff boxes) or bonbonnières (candy boxes). The snuff boxes are usually rectangular all have a hinge for they are for personal use, but the candy boxes which are round have removable lids so that one can offer a candy to others. It is a nice touch that in some of the cases either the tabatière is shown open or the bobonnière is shown upside down with its lid beside it so that one can see that every surface is decorated. In the center of the room is the piece de resistance, a table, which by any standard is over the top. In 1779 the Congress of Teschen was held in order to make a peace treaty to settle the War of Bavarian Succession. France and Russia both offered their diplomatic services to the warring parties. Russia was represented by Prince Nikolai Repnin and France by the diplomat and Ambassador to Austria, Baron de Breteuil. 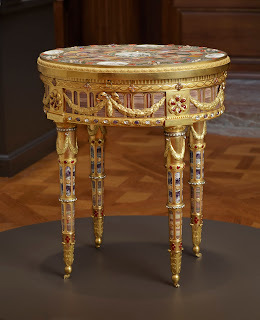 The resulting Treaty of Teschen ended the War to the great benefit of the Elector of Saxony and by way of thanks the Elector made a gift of a huge Meissen porcelain service to Repnin and the spectacular Neuber table to the Baron de Breuteuil. 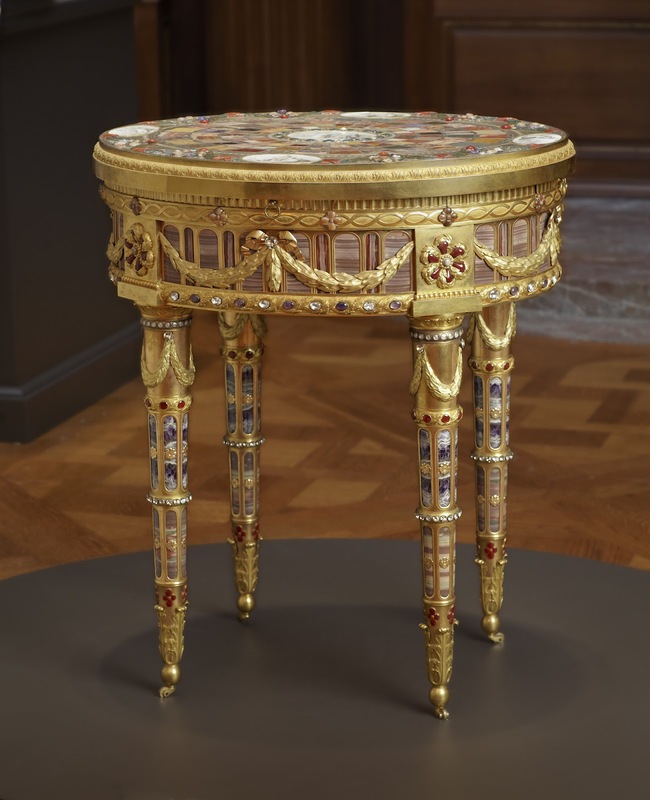 The Louis XVI style table is made up of 128 stones all with a designated number on the frame securing each stone in place. These numbers are listed in a handwritten catalog, which still exists inside the table (Neuber made similar catalogs for his boxes). An iPad app has been created which gives the history of the table and reproduces the handwritten catalog, with a printed version in English. There is an iPad mounted on the wall within the exhibit to use there, but if you prefer, you can go to the iPad App Store and search for Neuber and the free app is there for you to download. The catalog is exhaustive with 400 pages and 500 illustrations. It is edited by Alexis Kugel who added a Neuber Catalogue Raissoné at the end of the tome. The Director of the Green Vaults, Dirk Syndram and his deputy director, Jutta Kappel led a team of scholars from several countries in order to give us a complete picture of Neuber and his work. I must say that while I had an appreciation of Neuber before seeing the show he was never on my favorites list, but this exhibition gave me a whole new slant on the artist and I will look more carefully next time I see an example of his work. You only have one more month to see the exhibition which closes on August 19th. **All images courtesy of the Frick Collection.